Hello Friends! Man, I am happy to be back here and focused on the blog this week! Last week was a little crazy for us, both in good ways and in bad. Tim told you about some of our good news on Friday. Maybe I’ll go into the “bad” stuff some other time, but rather than focus on it, today I am excited to dive into a very simple and inexpensive DIY! There are a couple of changes, but did you notice the mirror? Before I started there was no bulletin board in this room, and I kind of feel like they are a necessity in an office. So I hung one up for functional use. 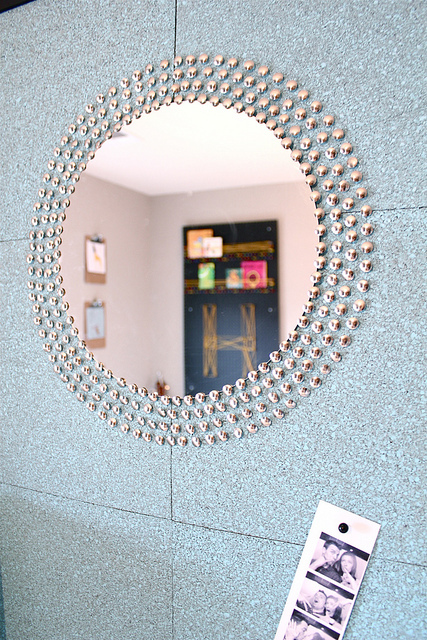 Then I decided that the room needed at least one mirror in it, so I attached a simple circular one (bought from a local craft store for a few bucks) to the bulletin board. I used velcro to attach it. The mirror all alone seemed very plain jane and unfinished to me. I wanted to spice it up a bit. So, I got to thinking about a material I could use that would make sense in the space. 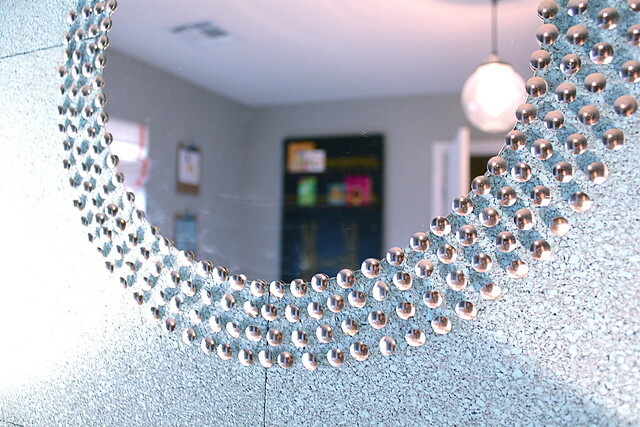 Well, being that this is an office and the mirror was on a bulletin board, I came to the conclusion that silver thumb tacks would be the perfect product to use. I ended up with this. . . The process was easy- I simply did my best to keep the tacks even distances apart and off set each ring. I really like how that mirror turned out. 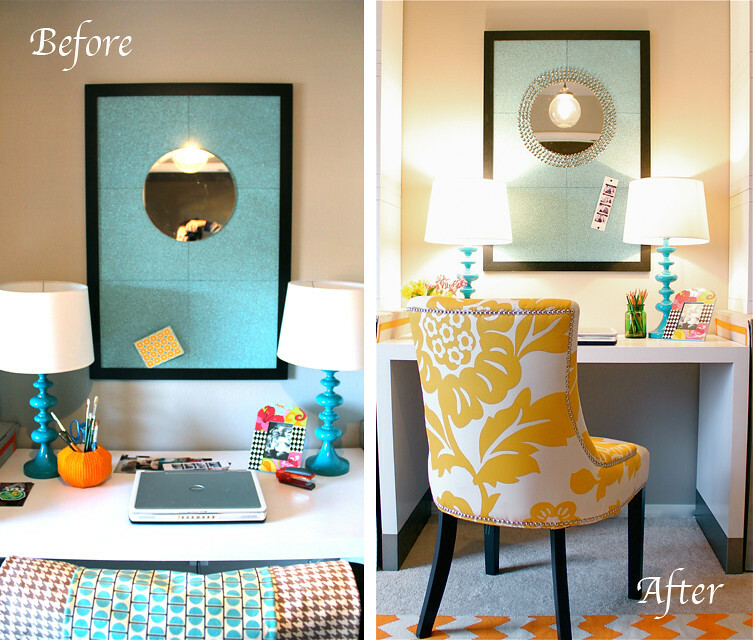 And I’m lovin’ that yellow chair and chevron rug! Genius, girl! 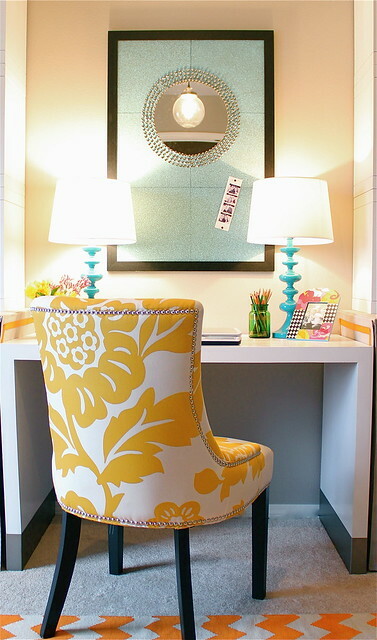 Perfect office nook! looks great! what a brilliant idea! That is a gorgeous space…love the mirror treatment and all the colors! Thanks Jill! I am glad to hear you are feeling better! Being sick is the worst. 🙁 PS- I need to e-mail you. How much do you charge to sew things like bench cushions? I am sure I could use your sewing prowess in the future! Well thanks Lauren! 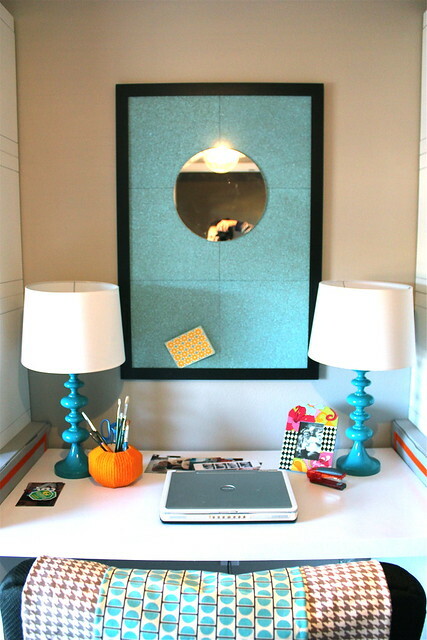 Love your chevron/zigzag wall- very cool! Hi, can you let me know what the blue fabric on the board is? I have a bulliten board that I’d like to use and recreate this look. Sorry it took us so long to answer your question. We actually just spray painted the corkboard. No fabric. It is hard to go wrong with spray paint. I love the bulletin board! I never thought to just spray paint one – thanks for the inspiration! I love this idea!!! My 13yr old daughter and I are getting some ideas together to re-do her room on a very limited budget to give it a more grown-up look and this would be perfect. I was also thinking about maybe using a smaller board to use as a “makeup” mirror…just a thought, we’ll see. Thanks for sharing.